KUALA LUMPUR: Students who want to take Bahasa Melayu as a single paper for the Sijil Pelajaran Malaysia (SPM) examination can do so with the approval of the National Examination Board. Deputy Education Minister Teo Nie Ching said in such cases candidates would only be given the results slip of the particular subject and not the SPM certification. “If the candidate only takes BM paper, then the result slip will only be given for that subject and this can only be done with the approval of the National Examination Board,” she said. Teo also clarified that the full SPM certificate would only be given to candidates who took six compulsory subjects and scored at least credits for both the BM and History papers. The six compulsory subject for all SPM candidates are BM, English, Islamic Studies or Moral Studies, History, Mathematics and Science. Earlier today, during the question and answer session, Teo said SPM candidates were allowed to take one subject instead of the prerequisite six subjects, if candidates were given prior approval. 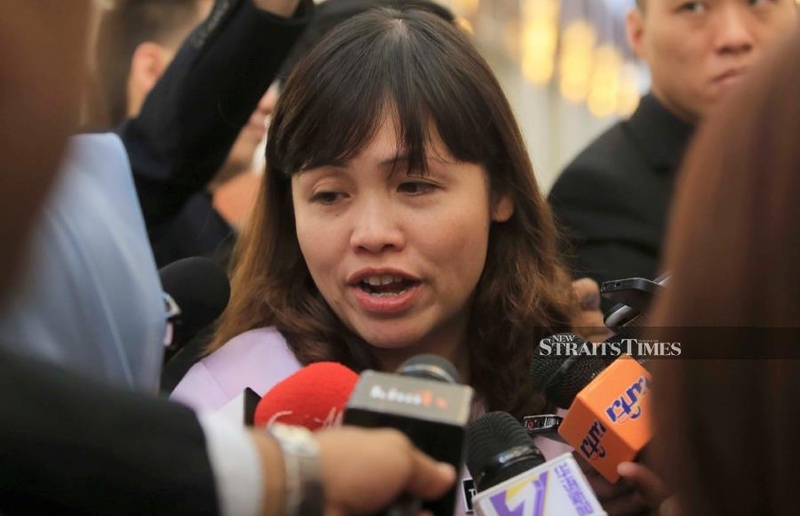 She was replying to Datuk Seri Wee Ka Siong (Ayer Hitam-BN) who had asked whether SPM would be made into an open examination, where candidates would be allowed to sit for a single subject. MALAYSIAN students undertaking the Cambridge International General Certificate of Secondary Education (IGCSE) as a pathway towards tertiary education can now choose Bahasa Melayu as a subject. The Cambridge IGCSE First Language Malay (0696) syllabus, introduced recently by the Cambridge Assessment International Education, offers a higher level and more challenging studies in Bahasa Melayu. Schools can start teaching the syllabus in September next year, with the first exam being set for June 2021. Prior to its introduction, Cambridge IGCSE offers only the Malay Foreign Language (0546) subject for students with no basic grounding in Bahasa Melayu. 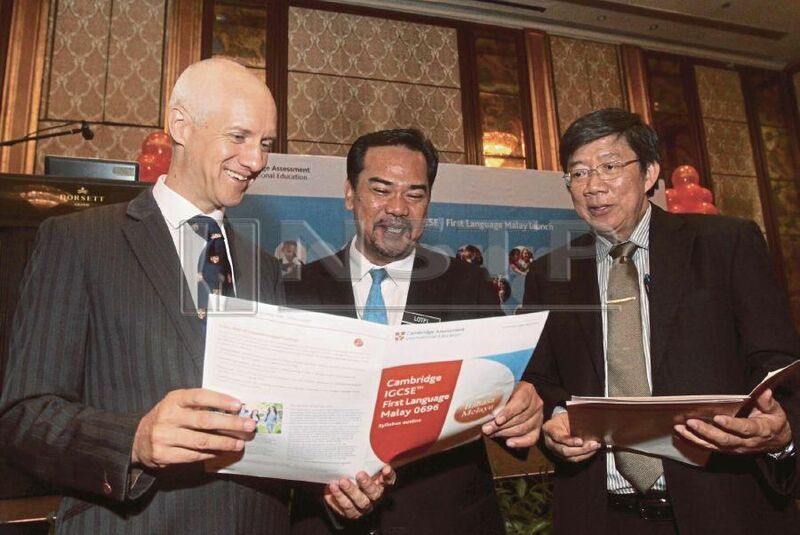 Cambridge Assessment International Education Southeast Asia & Pacific regional director Dr Ben Schmidt said the 0696 syllabus is catered for Malay native speakers. Candidates should have studied a Malay-language curriculum at lower secondary level or an equivalent national education framework. “We regularly review and update the programmes and qualifications that we offer to ensure they reflect the latest developments in teaching and learning in each country. “These updates are implemented to ensure that what we offer is parallel to the needs of schools around the world. In Malaysia, there is growing demand for a first language qualification in Bahasa Melayu. “This is a positive sign that native speakers are looking to advance their comprehension skills, and want to learn to respond knowledgeably and critically on a wide range of topics. With that, we are excited to introduce the Cambridge IGCSE First Language Malay,” said Schmidt. The syllabus aims to harness the learners’ ability to communicate clearly, accurately and effectively in Bahasa Melayu, besides developing an effective writing style. Learners are also encouraged to read widely for their own enjoyment and develop an appreciation of how writers achieve their flair. The syllabus is modelled after the successful and widely-recognised Cambridge IGCSE First Language English syllabus. However, it is in no way meant to be an equivalent of Bahasa Melayu in Sijil Pelajaran Malaysia (SPM). 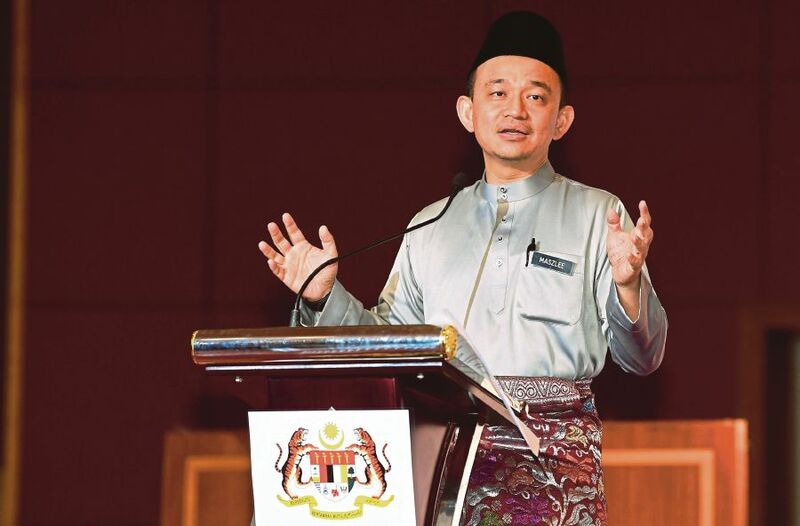 Education Minister Dr Maszlee Malik said the ministry, via Dewan Bahasa dan Pustaka (DBP), will launch Dekad Bahasa Kebangsaan (National Language Decade) which will map out a comprehensive plan to make the national language the language of choice in the country. “Malaysia is ‘too small’ (to do justice to Bahasa Melayu). We will also be promoting and empowering the national language throughout the Asean region. “Asean is also too small for the national language. That is why we will be taking Bahasa Melayu to the world stage,” he said. Maszlee was speaking at the ministry’s monthly assembly and Hari Raya Aidilifitri celebration here on Thursday. He said, over the next five years, the ministry will also work towards placing DBP on par with centres and language institutes of developed nations. “We will work hard to elevate DPB on the same level as the British Council, Goethe Institute and Nippon Institute. “It is with this aim in mind that we are embarking on this venture and we aim to make it a reality,” he said. Maszlee said that at the same time, the ministry is aware that the reading culture among Malaysians have yet to reach a satisfactory level. “In reality, it is lagging behind compared to other developed nations. The Education Ministry, in cooperation with other ministries and its agencies, will revive the National Reading Campaign, first introduced in the 1990s, which will run for two years,” he said. The campaign will involve two stages – the first two years will see a more aggressive, radical and unconventional approach to ensure that Malaysians inculcate the reading habit. “From 2020 to 2030, the period will be declared the National Language Decade. DBP will once again be entrusted with spearheading this initiative and we hope that in 2030, Malaysians will be known around the world as a reading society,” he said. BAHASA Melayu is a distinguished and classy language, befitting its stature as our national language. The language is infused with finesse and subtlety, making it one of the most beautiful languages in the world. Just look at phrases like minta diri, langkah kanan or terima kasih. Its translation into another language fails to capture its embedded cultural values, rendering it literal in impact. That said, many feel that Bahasa Melayu is a lesser language. Often, the feeling is that Bahasa Melayu is too simplistic or too poetic. It lacks the competitiveness to be as lucid and cogent as English or French. I beg to differ. We feel this way because we do not know Bahasa Melayu well enough to appreciate it. Admittedly, some words in Bahasa Melayu are not as efficient in letters as compared with English. We tend to feel that perpustakaan is a mouthful compared with “library”, but we do not use the same yardstick when we compare “comprehensive” with tuntas. Or maybe we have never heard of tuntas. The point I am making is that we need to continue our lessons in Bahasa Melayu. As native speakers, we can ill afford haphazard of improper usage of the language. Its usage needs to be not just correct but also fluent and immaculate. At the same time, we need to safeguard the sanctity of Bahasa Melayu and nip in the bud preposterous WeChat language. Here are some ways to achieve it. We can start by reviewing Akta Bahasa Kebangsaan ) 1963/67 and give it a new breath of life or rather “teeth” to bite. Missing from legislation is the legal implication to its offender. Bahasa Melayu is a compulsory subject only up to the secondary level. At the tertiary level, it is an elective subject that is often ignored, unless you are majoring in language or communication. This needs to change. Those in high offices are expected to have excellent command of Bahasa Melayu. Only then will knowledge and skills be passed down. A case in point was that not too long ago, we were anxiously waiting for new Malay words to be unearthed from the thickness of Kamus Dewan at a budget presentation at Parliament. The music community should show off their prowess in Bahasa Melayu by writing beautiful songs with all the richness of its vocabulary. It should not just be any words to fit the tempo. M. Nasir has shown his worth in this. The lyrics in his songs are exemplary, reflective of his mastery of the language. We could also benefit from better quality Bahasa Melayu publications in the market. The authors and publishers play an important role to this end. The public needs to read to learn. Romance novels are fine provided that proper Bahasa Melayu is used. We should be more supportive and more enthusiastic towards language-related events, such as debates, poems writing competitions, pesta pantun and essay competitions to promote Bahasa Melayu. It should be publicised in the media and we could tap social media to do this. However, learning English or other languages will not be at the expense of Bahasa Melayu. Learning Mathematics and Science in English does not make Bahasa Melayu a second-rate subject. To object to this without making efforts to uphold Bahasa Melayu is just as ludicrous. We should promote and not limit children’s learning opportunities. It may not be everyone’s cup of tea, but our children’s future is at stake. By SHAHRIL NIZAM ABDUL MALEK . JITRA: Dewan Bahasa dan Pustaka (DBP) will be given the power to take legal action against those who failed to uphold Bahasa Malaysia as the national language. Education Minister Datuk Seri Mahdzir Khalid said the proposal to grant DBP with the enforcement power is one of the suggestions to be deliberated by a soon-to-be-set-up special Cabinet committee. Mahdzir said the special committee, to be chaired by Deputy Prime Minister Datuk Seri Dr Ahmad Zahid Hamidi, is being formed as part of an effort to further strengthen the use of national language in all sectors in the country. He added that the matter will also be discussed in the next few weeks. “I will table the proposal to the Cabinet within then next two or three weeks,” he said after attending a gathering with lecturers from Teachers’ Training Institute and Biro Tata Negara at Institut Perguruan Kampus Darulaman. Mahdzir said among the matters that will be highlighted to the proposed committee is the upgrading of the DBP’s role in enforcing Bahasa Malaysia from its current function as a reference body. “For example, the national language should be given priority in any websites and should the operators refused to comply with the regulation, DBP will have the authority to take action against the parties concerned. “This proposal will be discussed by the special Cabinet committee before we can table it in Parliament for approval,” he said. Mahdzir said the Education Ministry will also act as the secretariat for the committee which will include several other ministries such as the Urban Wellbeing, Housing and Local Government Ministry and the Science, Technology and Innovation Ministry (Mosti). Have good grasp of Bahasa Malaysia, students told. THE Sultan of Perak, Sultan Nazrin Shah said vernacular schools must make sure their students were proficient in the national language. They should have a degree of fluency in Bahasa Malaysia that is comparable, if not better than students in national schools. He said the efforts of students in mastering the national language should be accepted as a challenge, and the achievement of the students in mastering it should be made one of the key indices of vernacular schools. “The success of vernacular schools in getting their pupils to master the national language will help in building a united nation and minimise the uneasiness of some communities towards such schools,” he said. 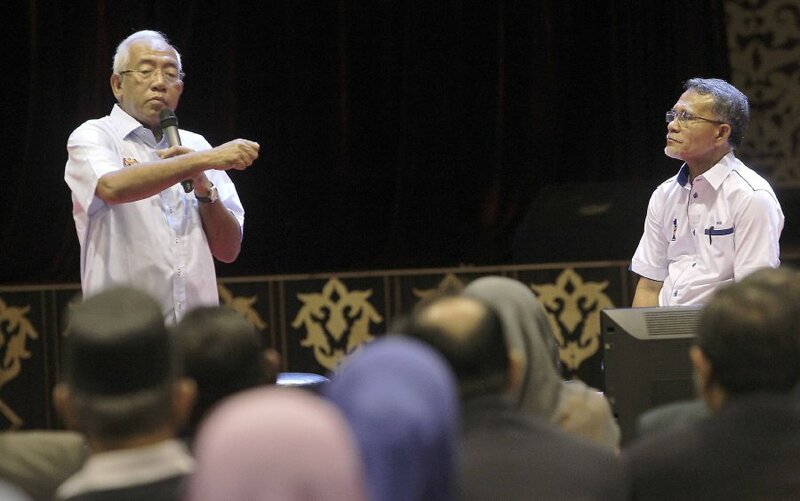 He was speaking at the recent excellence awards ceremony of SMJK Sam Tet in Ipoh. Also present at the event were the Raja Permaisuri of Perak Tuanku Zara Salim, Menteri Besar Datuk Seri Dr Zambry Abd Kadir and his wife, Datin Seri Saripah Zulkifli. 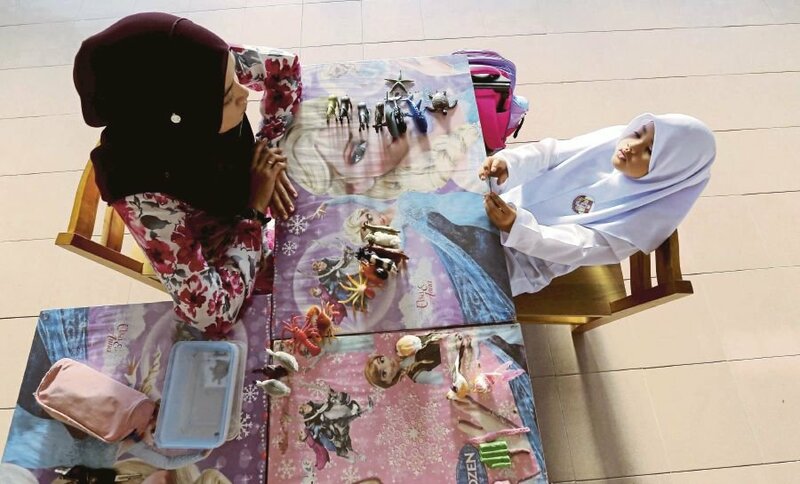 When the National Education Policy was drafted, Sultan Nazrin said the concept of single school stream was introduced, but over the years vernacular schools were granted permission to continue operating. He said the stand of the Government must therefore be appreciated and vernacular schools must prove that they are able to inculcate unity. Meanwhile, he said non-Chinese schoolchildren in vernacular schools should be proactive in exploring the environment of students of various religions, races, cultures and languages to understand and cooperate with each other. You are currently browsing the archives for the Bahasa Melayu category.